As summer ends, it is a good time to collect dry material in the fields for use as fillers during the fall and winter. This is also a good time to recruit new members. The flower guilds have a really joyful, beautiful service to offer in helping set the table to welcome the guests. It is a constantly changing and learning experience and the guilds I have been a member of have all been very helpful and cooperative to each other. 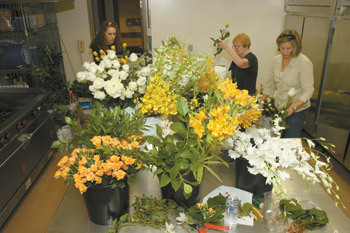 Everyone comes at Christmas and Easter to do the huge festival arrangements. If your church does not do any of their own flower arranging, I would suggest you encourage a few people to try it. I have experienced a huge saving in money for altar flowers and great interest from the congregation. I currently have four teams and they all arrange a little differently. When someone must miss a turn, others are anxious to fill in. Actually, I assign them the space they are to work in and rarely the type flowers, and they do what they wish. We use one retail/wholesaler (good prices) and charge with a price limit. This would not work in a large church with multiple arrangements or for big holidays. Then one person should plan, order and supervise the division of the flowers. For either big holidays or multiple arrangements I use buckets with signs on them so the team will know which area the flowers are for. It is a very rewarding service. If all goes wrong, just take the arrangement apart, say a prayer and start over again. You will leave happy and at peace, no matter how you arrived.